Definition at line 45 of file functions.h. Definition at line 51 of file functions.h. 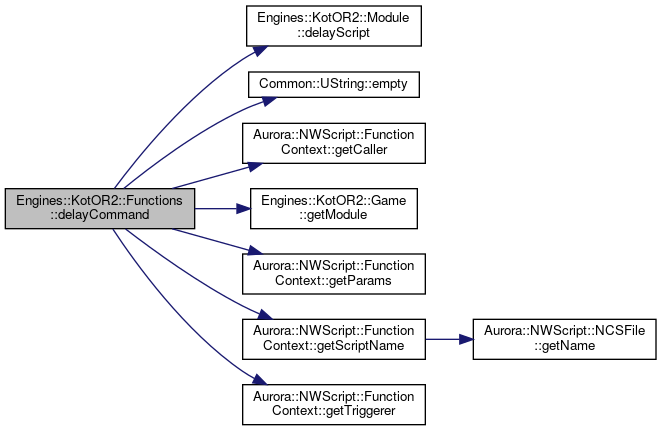 Definition at line 50 of file functions.cpp. Definition at line 54 of file functions.cpp. Definition at line 36 of file functions_math.cpp. References ABS(), Aurora::NWScript::FunctionContext::getParams(), and Aurora::NWScript::FunctionContext::getReturn(). Definition at line 56 of file functions_math.cpp. References Aurora::NWScript::FunctionContext::getParams(), Aurora::NWScript::FunctionContext::getReturn(), and Common::rad2deg(). Definition at line 62 of file functions_action.cpp. References _game, Aurora::NWScript::FunctionContext::getCaller(), Engines::KotOR2::Game::getModule(), Aurora::NWScript::FunctionContext::getParams(), and Engines::KotOR2::Module::startConversation(). 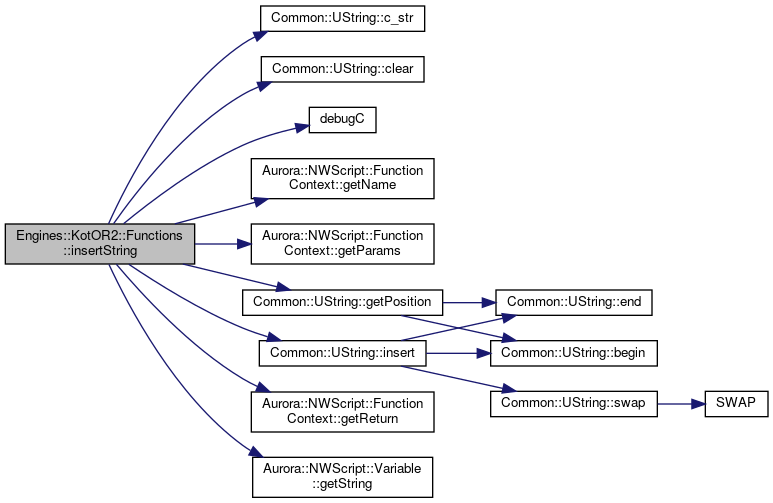 Definition at line 60 of file functions_math.cpp. Definition at line 40 of file functions_action.cpp. References _game, Engines::KotOR2::Module::delayScript(), Common::UString::empty(), Engines::KotOR2::Game::getModule(), getParamObject(), Aurora::NWScript::FunctionContext::getParams(), Aurora::NWScript::FunctionContext::getScriptName(), and Aurora::NWScript::FunctionContext::getTriggerer(). Definition at line 64 of file functions_math.cpp. Definition at line 44 of file functions_math.cpp. References Common::deg2rad(), Aurora::NWScript::FunctionContext::getParams(), and Aurora::NWScript::FunctionContext::getReturn(). Definition at line 104 of file functions_math.cpp. References Aurora::NWScript::FunctionContext::getParams(), getRandom(), and Aurora::NWScript::FunctionContext::getReturn(). Definition at line 116 of file functions_math.cpp. Definition at line 108 of file functions_math.cpp. Definition at line 84 of file functions_math.cpp. Definition at line 112 of file functions_math.cpp. Definition at line 88 of file functions_math.cpp. Definition at line 92 of file functions_math.cpp. Definition at line 96 of file functions_math.cpp. Definition at line 100 of file functions_math.cpp. 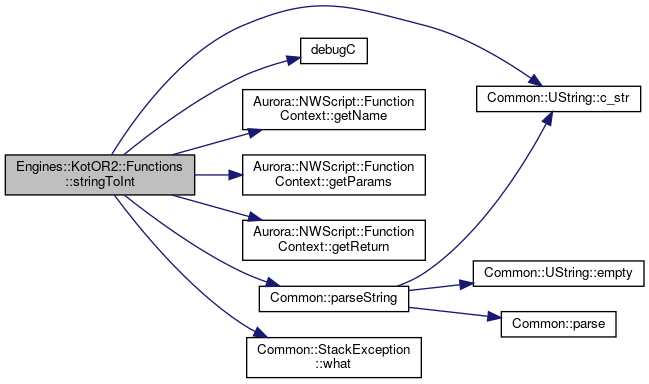 Definition at line 50 of file functions_action.cpp. References _game, Engines::KotOR2::Module::delayScript(), Common::UString::empty(), Aurora::NWScript::FunctionContext::getCaller(), Engines::KotOR2::Game::getModule(), Aurora::NWScript::FunctionContext::getParams(), Aurora::NWScript::FunctionContext::getScriptName(), and Aurora::NWScript::FunctionContext::getTriggerer(). Definition at line 40 of file functions_math.cpp. Definition at line 227 of file functions_string.cpp. References Common::UString::end(), Common::UString::findFirst(), Aurora::NWScript::FunctionContext::getParams(), Common::UString::getPosition(), and Aurora::NWScript::FunctionContext::getReturn(). Definition at line 124 of file functions_math.cpp. Definition at line 112 of file functions_string.cpp. References formatFloat(), Aurora::NWScript::FunctionContext::getParams(), and Aurora::NWScript::FunctionContext::getReturn(). Definition at line 111 of file functions.cpp. 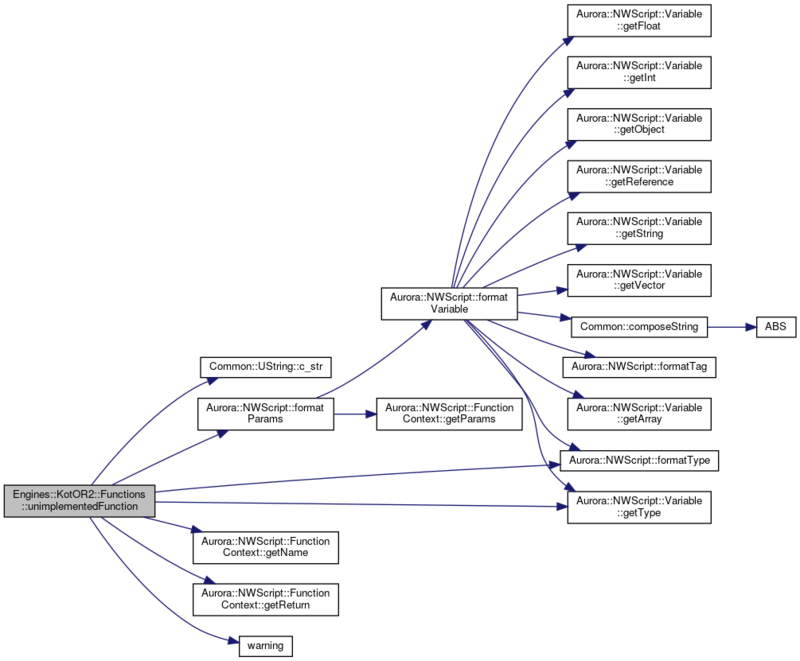 Referenced by floatToString(), and printFloat(). Definition at line 41 of file functions_object.cpp. Definition at line 45 of file functions_object.cpp. Definition at line 50 of file functions_object.cpp. Definition at line 43 of file functions_module.cpp. References _game, Engines::KotOR2::Game::getModule(), Engines::KotOR2::Module::getPC(), and Aurora::NWScript::FunctionContext::getReturn(). Definition at line 55 of file functions_object.cpp. Definition at line 49 of file functions_situated.cpp. 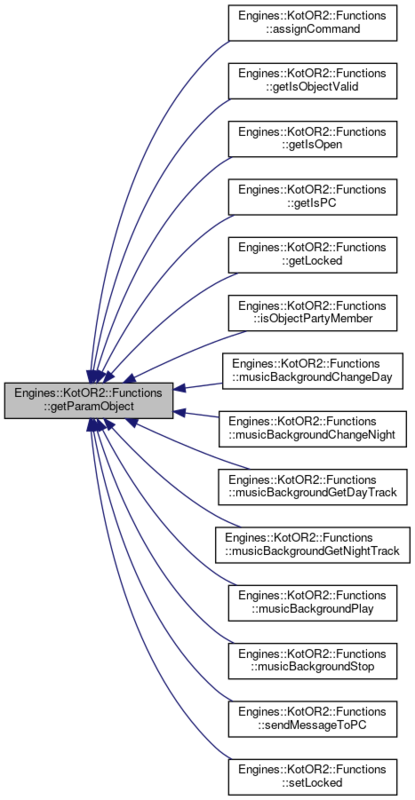 References getParamObject(), Aurora::NWScript::FunctionContext::getReturn(), Engines::KotOR2::Situated::isOpen(), and Engines::KotOR2::ObjectContainer::toSituated(). Definition at line 59 of file functions_object.cpp. References getParamObject(), Aurora::NWScript::FunctionContext::getReturn(), and Engines::KotOR2::ObjectContainer::toPC(). Definition at line 65 of file functions_situated.cpp. References Aurora::NWScript::FunctionContext::getCaller(), Engines::KotOR2::Situated::getLastClosedBy(), Aurora::NWScript::FunctionContext::getReturn(), and Engines::KotOR2::ObjectContainer::toSituated(). Definition at line 55 of file functions_situated.cpp. References Aurora::NWScript::FunctionContext::getCaller(), Engines::KotOR2::Situated::getLastOpenedBy(), Aurora::NWScript::FunctionContext::getReturn(), and Engines::KotOR2::ObjectContainer::toSituated(). Definition at line 75 of file functions_situated.cpp. References Aurora::NWScript::FunctionContext::getCaller(), Engines::KotOR2::Situated::getLastUsedBy(), Aurora::NWScript::FunctionContext::getReturn(), and Engines::KotOR2::ObjectContainer::toSituated(). Definition at line 40 of file functions_local.cpp. References Common::composeString(), Aurora::NWScript::Variable::getInt(), Aurora::NWScript::FunctionContext::getParams(), Aurora::NWScript::FunctionContext::getReturn(), and Aurora::NWScript::kTypeInt. Definition at line 58 of file functions_local.cpp. Definition at line 37 of file functions_situated.cpp. References getParamObject(), Aurora::NWScript::FunctionContext::getReturn(), Engines::KotOR2::Situated::isLocked(), and Engines::KotOR2::ObjectContainer::toSituated(). Definition at line 39 of file functions_module.cpp. References _game, Engines::KotOR2::Game::getModule(), and Aurora::NWScript::FunctionContext::getReturn(). Definition at line 47 of file functions_module.cpp. Definition at line 67 of file functions_object.cpp. References _game, Aurora::NWScript::ObjectContainer::findObjectsByTag(), Engines::KotOR2::Game::getModule(), Aurora::NWScript::FunctionContext::getParams(), and Aurora::NWScript::FunctionContext::getReturn(). Definition at line 115 of file functions.cpp. References Aurora::NWScript::FunctionContext::getCaller(), Aurora::NWScript::FunctionContext::getParams(), Engines::KotOR2::Object::getType(), Engines::KotOR2::kObjectTypeInvalid, Engines::KotOR2::kObjectTypeSelf, and Engines::KotOR2::ObjectContainer::toObject(). Referenced by assignCommand(), getIsObjectValid(), getIsOpen(), getIsPC(), getLocked(), isObjectPartyMember(), musicBackgroundChangeDay(), musicBackgroundChangeNight(), musicBackgroundGetDayTrack(), musicBackgroundGetNightTrack(), musicBackgroundPlay(), musicBackgroundStop(), sendMessageToPC(), and setLocked(). Definition at line 99 of file functions.cpp. 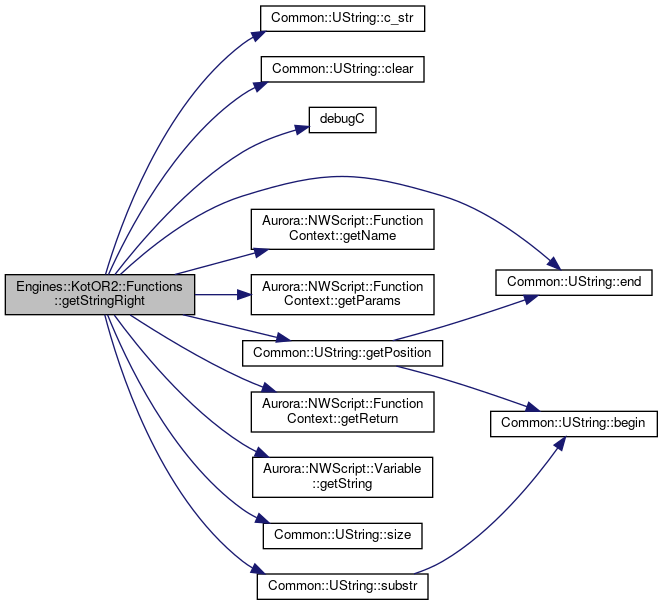 Referenced by d10(), d100(), d12(), d2(), d20(), d3(), d4(), d6(), d8(), and random(). Definition at line 240 of file functions_string.cpp. References Aurora::NWScript::FunctionContext::getParams(), Aurora::NWScript::FunctionContext::getReturn(), and TalkMan. Definition at line 177 of file functions_string.cpp. References Common::UString::begin(), Common::UString::c_str(), Common::UString::clear(), debugC(), Aurora::NWScript::FunctionContext::getName(), Aurora::NWScript::FunctionContext::getParams(), Common::UString::getPosition(), Aurora::NWScript::FunctionContext::getReturn(), Aurora::NWScript::Variable::getString(), Common::kDebugEngineScripts, Common::UString::size(), and Common::UString::substr(). Definition at line 150 of file functions_string.cpp. Definition at line 158 of file functions_string.cpp. Definition at line 162 of file functions_string.cpp. References Common::UString::c_str(), Common::UString::clear(), debugC(), Common::UString::end(), Aurora::NWScript::FunctionContext::getName(), Aurora::NWScript::FunctionContext::getParams(), Common::UString::getPosition(), Aurora::NWScript::FunctionContext::getReturn(), Aurora::NWScript::Variable::getString(), Common::kDebugEngineScripts, Common::UString::size(), and Common::UString::substr(). Definition at line 154 of file functions_string.cpp. Definition at line 207 of file functions_string.cpp. References Common::UString::c_str(), Common::UString::clear(), debugC(), Aurora::NWScript::FunctionContext::getName(), Aurora::NWScript::FunctionContext::getParams(), Common::UString::getPosition(), Aurora::NWScript::FunctionContext::getReturn(), Aurora::NWScript::Variable::getString(), Common::kDebugEngineScripts, Common::UString::size(), and Common::UString::substr(). Definition at line 192 of file functions_string.cpp. References Common::UString::c_str(), Common::UString::clear(), debugC(), Aurora::NWScript::FunctionContext::getName(), Aurora::NWScript::FunctionContext::getParams(), Common::UString::getPosition(), Aurora::NWScript::FunctionContext::getReturn(), Aurora::NWScript::Variable::getString(), Common::UString::insert(), and Common::kDebugEngineScripts. Definition at line 120 of file functions_math.cpp. Definition at line 120 of file functions_string.cpp. References Common::UString::format(), Aurora::NWScript::FunctionContext::getParams(), and Aurora::NWScript::FunctionContext::getReturn(). Definition at line 108 of file functions_string.cpp. References Common::composeString(), Aurora::NWScript::FunctionContext::getParams(), and Aurora::NWScript::FunctionContext::getReturn(). Definition at line 63 of file functions_object.cpp. References getParamObject(), Aurora::NWScript::FunctionContext::getReturn(), and Engines::KotOR2::ObjectContainer::toPartyMember(). Definition at line 126 of file functions.cpp. 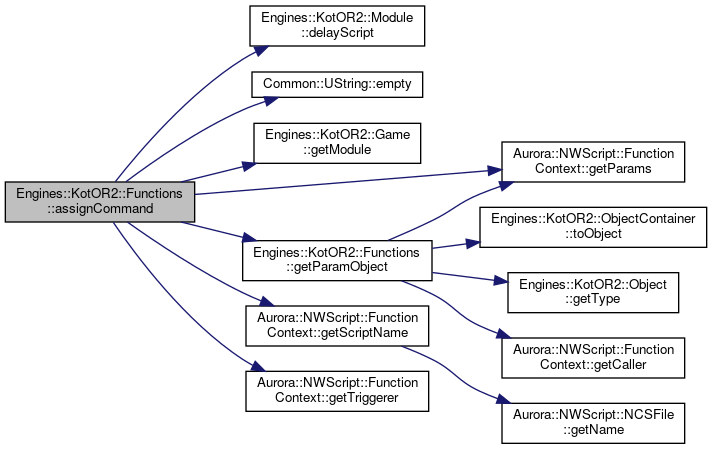 Definition at line 68 of file functions_math.cpp. Definition at line 49 of file functions_sound.cpp. References getParamObject(), Aurora::NWScript::FunctionContext::getParams(), Engines::KotOR2::Area::setMusicDayTrack(), and Engines::KotOR2::ObjectContainer::toArea(). Definition at line 55 of file functions_sound.cpp. References getParamObject(), Aurora::NWScript::FunctionContext::getParams(), Engines::KotOR2::Area::setMusicNightTrack(), and Engines::KotOR2::ObjectContainer::toArea(). Definition at line 61 of file functions_sound.cpp. References Engines::KotOR2::Area::getMusicDayTrack(), getParamObject(), Aurora::NWScript::FunctionContext::getReturn(), and Engines::KotOR2::ObjectContainer::toArea(). Definition at line 67 of file functions_sound.cpp. References Engines::KotOR2::Area::getMusicNightTrack(), getParamObject(), Aurora::NWScript::FunctionContext::getReturn(), and Engines::KotOR2::ObjectContainer::toArea(). Definition at line 37 of file functions_sound.cpp. References getParamObject(), Engines::KotOR2::Area::playAmbientMusic(), and Engines::KotOR2::ObjectContainer::toArea(). Definition at line 43 of file functions_sound.cpp. References getParamObject(), Engines::KotOR2::Area::stopAmbientMusic(), and Engines::KotOR2::ObjectContainer::toArea(). Definition at line 92 of file functions_string.cpp. References Common::UString::format(), Aurora::NWScript::formatTag(), Aurora::NWScript::FunctionContext::getParams(), and Aurora::NWScript::FunctionContext::getReturn(). Definition at line 37 of file functions_movie.cpp. Definition at line 72 of file functions_math.cpp. Definition at line 74 of file functions_string.cpp. References formatFloat(), Aurora::NWScript::FunctionContext::getParams(), and status(). Definition at line 70 of file functions_string.cpp. Definition at line 86 of file functions_string.cpp. References Aurora::NWScript::formatTag(), Aurora::NWScript::FunctionContext::getParams(), and status(). Definition at line 82 of file functions_string.cpp. 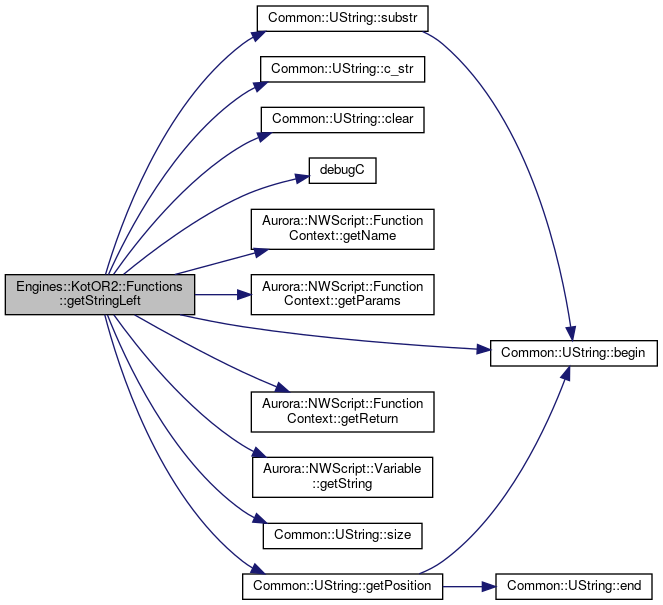 Definition at line 99 of file functions_string.cpp. Definition at line 80 of file functions_math.cpp. Definition at line 58 of file functions.cpp. References ARRAYSIZE, Engines::KotOR2::Functions::FunctionDefaults::defaults, Engines::KotOR2::Functions::FunctionPointer::func, FunctionMan, Engines::KotOR2::Functions::FunctionPointer::id, Engines::KotOR2::Functions::FunctionSignature::id, Engines::KotOR2::Functions::FunctionDefaults::id, kFunctionDefaults, kFunctionPointers, kFunctionSignatures, Aurora::NWScript::kTypeVoid, Engines::KotOR2::Functions::FunctionPointer::name, Engines::KotOR2::Functions::FunctionSignature::parameters, Engines::KotOR2::Functions::FunctionSignature::returnType, and unimplementedFunction(). Definition at line 58 of file functions_string.cpp. 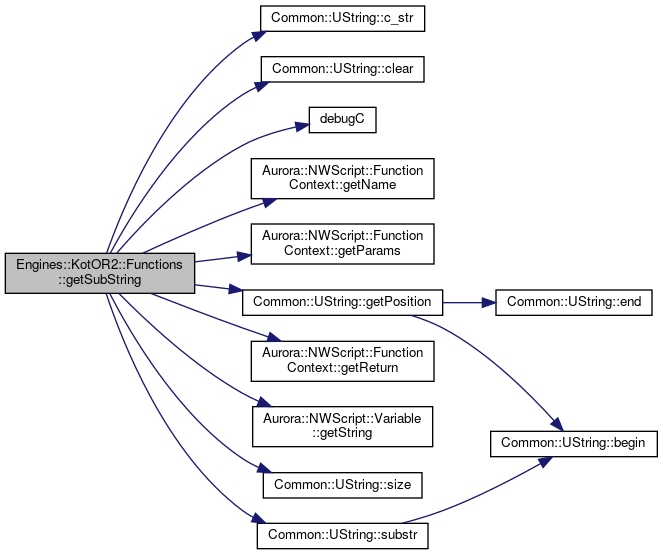 References Common::UString::c_str(), debugC(), Aurora::NWScript::FunctionContext::getName(), Engines::KotOR2::Object::getName(), getParamObject(), Aurora::NWScript::FunctionContext::getParams(), Common::kDebugEngineScripts, Engines::KotOR2::ObjectContainer::toPC(), and warning(). Definition at line 49 of file functions_local.cpp. References Common::composeString(), Aurora::NWScript::FunctionContext::getParams(), and Aurora::NWScript::kTypeInt. Definition at line 67 of file functions_local.cpp. Definition at line 43 of file functions_situated.cpp. References getParamObject(), Aurora::NWScript::FunctionContext::getParams(), Engines::KotOR2::Situated::setLocked(), and Engines::KotOR2::ObjectContainer::toSituated(). Definition at line 48 of file functions_math.cpp. Definition at line 76 of file functions_math.cpp. Definition at line 137 of file functions_string.cpp. References Common::UString::c_str(), debugC(), Aurora::NWScript::FunctionContext::getName(), Aurora::NWScript::FunctionContext::getParams(), Aurora::NWScript::FunctionContext::getReturn(), Common::kDebugEngineScripts, Common::parseString(), and Common::StackException::what(). Definition at line 124 of file functions_string.cpp. Definition at line 52 of file functions_math.cpp. Definition at line 94 of file functions.cpp. References Common::UString::c_str(), Aurora::NWScript::formatParams(), Aurora::NWScript::formatType(), Aurora::NWScript::FunctionContext::getName(), Aurora::NWScript::FunctionContext::getReturn(), Aurora::NWScript::Variable::getType(), and warning(). Definition at line 128 of file functions_math.cpp. References Aurora::NWScript::FunctionContext::getParams(), Aurora::NWScript::FunctionContext::getReturn(), and Aurora::NWScript::Variable::setVector(). Definition at line 134 of file functions_math.cpp. Definition at line 141 of file functions_math.cpp. Definition at line 52 of file functions_string.cpp. References Common::UString::c_str(), Common::DateTime::formatDateTimeISO(), Aurora::NWScript::FunctionContext::getParams(), Common::DateTime::kUTC, and status(). Definition at line 75 of file functions.h. Referenced by actionStartConversation(), assignCommand(), delayCommand(), getFirstPC(), getModule(), and getObjectByTag(). The table defining the default values for the parameters of each engine function. Definition at line 72 of file functions.h. 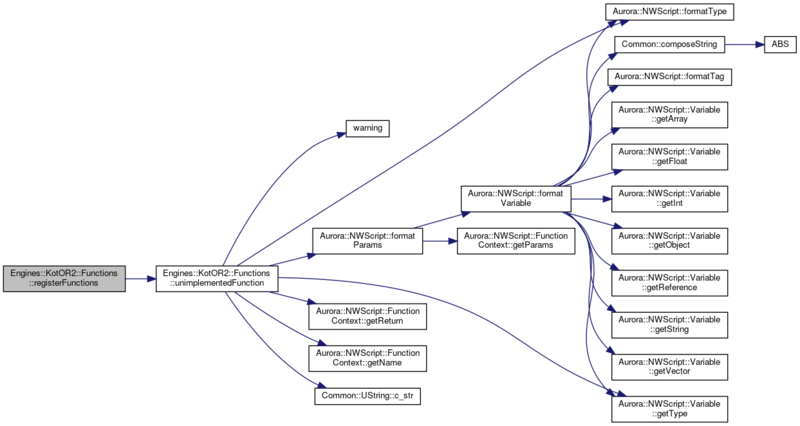 Definition at line 70 of file functions.h. The table defining the signature (return type and type of parameters) of each engine function. Definition at line 71 of file functions.h.